While attending my nephew’s wedding in Houston, TX in early May, one of my brother-in-law’s friends approached me and asked if I would go fishing with him when they came to Colorado at the end of September to attend the CU vs. UGA college football game. I replied that I’d love to. As the date approached, I contacted my brother-in-law, Bill, and found out that they were staying at their Ritz Carlton time share at Bachelor Gulch near Beaver Creek. I considered the Eagle River, Frying Pan River, Roaring Fork and Yampa River. The Eagle is a freestone river, and I have not experienced much success there late in the season when the flows are low, so I ruled this out for novice fishermen even though it was very convenient. I’ve had great success on the Frying Pan in September and October with decent hatches on the tailwater, so I recommended this as our destination. 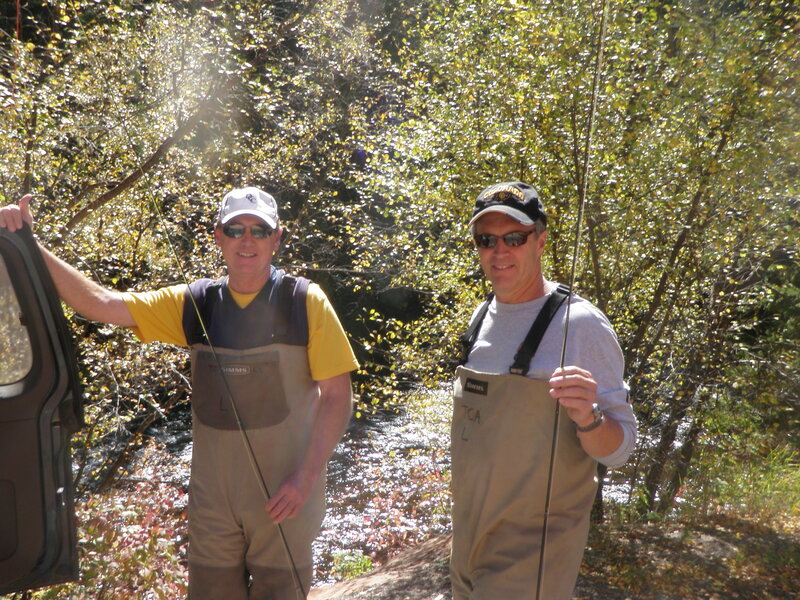 I called Taylor Creek Fly Shop and made reservations for guided wade fishing the Frying Pan River for the two Georgia fishermen for September 30. Eventually we changed the reservation to ½ day to better accommodate their schedules and Bill’s late arrival on Wednesday night. I drove to the Ritz Carlton after work on Wednesday and hung out with Jeff and his wife Gail and my sister-in-law Judy and ate dinner at the Ritz Carlton. The girls arranged to rent bikes in Glenwood Springs and bike Glenwood Canyon while we fished, and then we would all meet at the Riverside Café next to the fly shop at the end of the day. 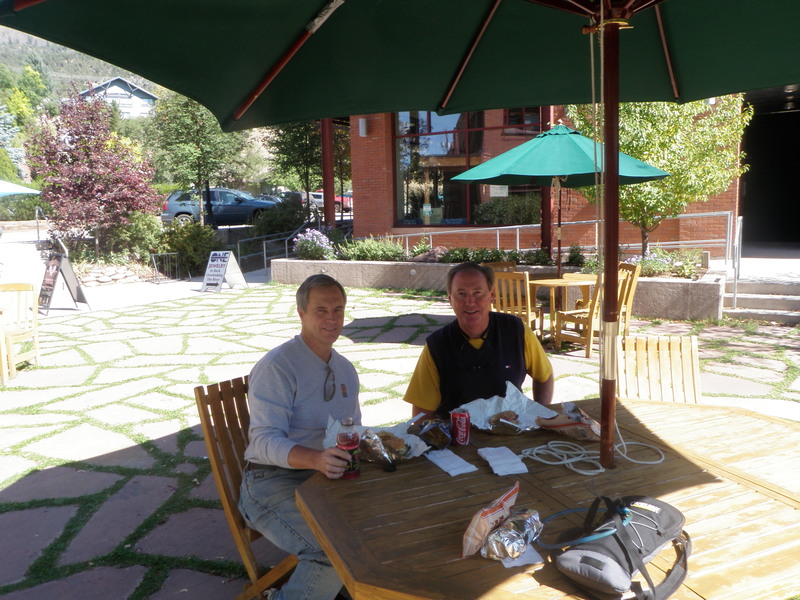 I drove Jeff and Bill to Basalt in the minivan, and we grabbed a tasty lunch at Val’s Gourmet Deli. Bill and Jeff met their guide Ollie at 12:45, and I followed the guide’s car to a pullout along the Frying Pan between MM12 and MM13. 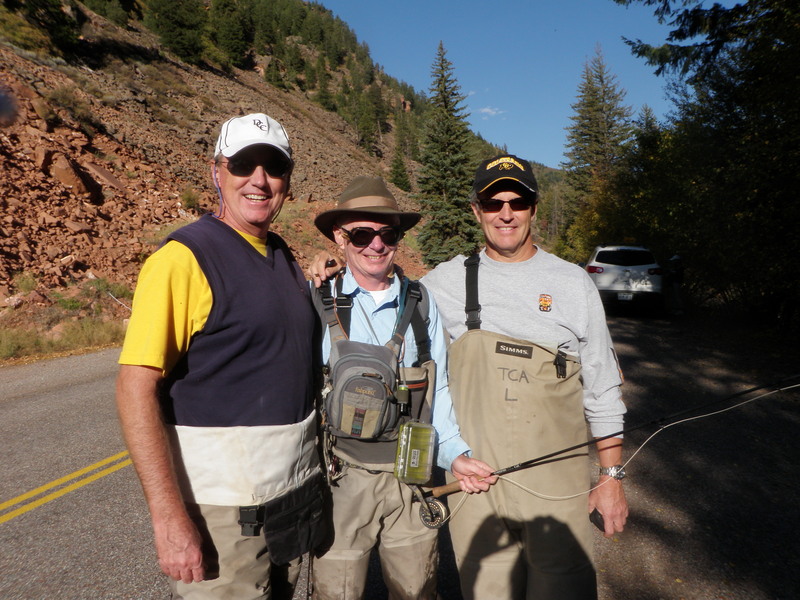 I left Bill and Jeff in good hands with the guide and hiked along the road a ways upstream where I entered the river and began fishing. It was 1:30PM by the time I began casting. Initially I tied on a green drake comparadun hoping that they were still hatching, and that I could pound up some fish on the large visible fly. This worked in the first pocket as I landed a small brown, but as I continued fishing, it didn’t receive any more interest. I spotted some small mayflies in the air, so I added an RS2 dropper. This produced a few fish, but the green drake kept sinking as it absorbed water, so I clipped it off and tied on a Chernobyl ant, then a beadhead hares ear, then the RS2. 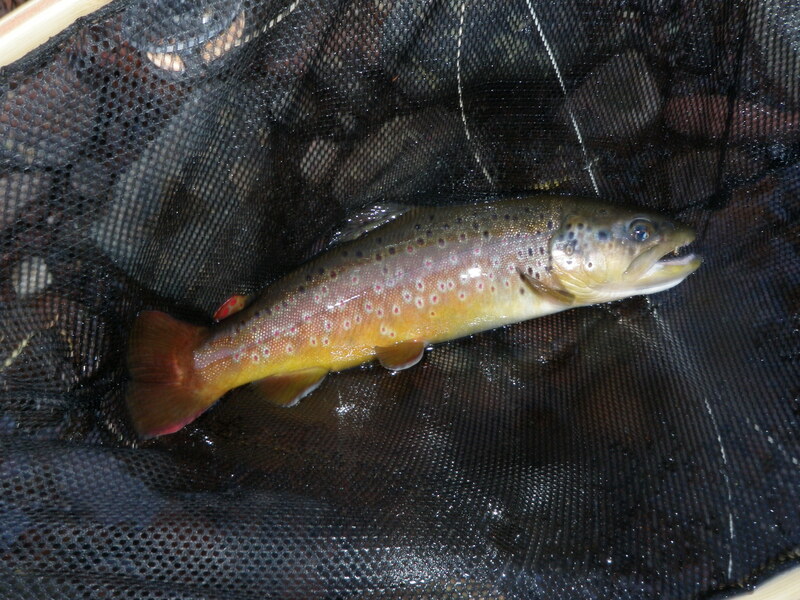 The BWO hatch intensified between 2 and 3:30PM, and I picked up medium sized browns and rainbows during this time period primarily on the RS2. At one point, I noticed some sporadic rises, so I switched to a CDC BWO. I landed one fish, but noticed more refusals than takes, so I went back to the triple fly set up with the RS2 on the point. 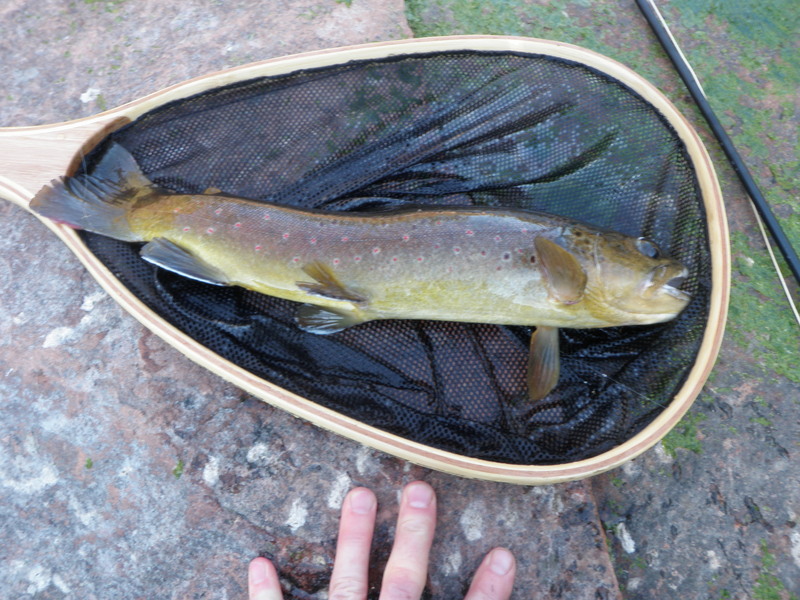 During the period of hatching activity, I landed 7 trout as six grabbed the RS2 and one liked the beadhead hares ear. When the action slowed, I decided to return to the spot where I’d left Bill and Jeff with the guide. They were still near their starting point, but on the opposite bank. I snapped a photo of each of them then proceeded downstream 30 yards or so and worked my way back up to their position. I landed five additional trout over the remainder of the afternoon up until 5PM. The average size of these fish was larger than the early afternoon fish. The largest fish was a brown that fell to the Chernobyl ant. I also landed two on the beadhead hares ear, and the last two succumbed to a light gray caddis and a light yellow caddis. Judy and Gail arrived at around 4:15 and watched as Bill and Jeff finished their day. As Bill and Jeff cautiously waded back to the roadside with assistance from Ollie, I worked my way up to a position in front of Judy. I also noticed a couple unrelated to our group was sitting on a rock next to the stream observing the action. 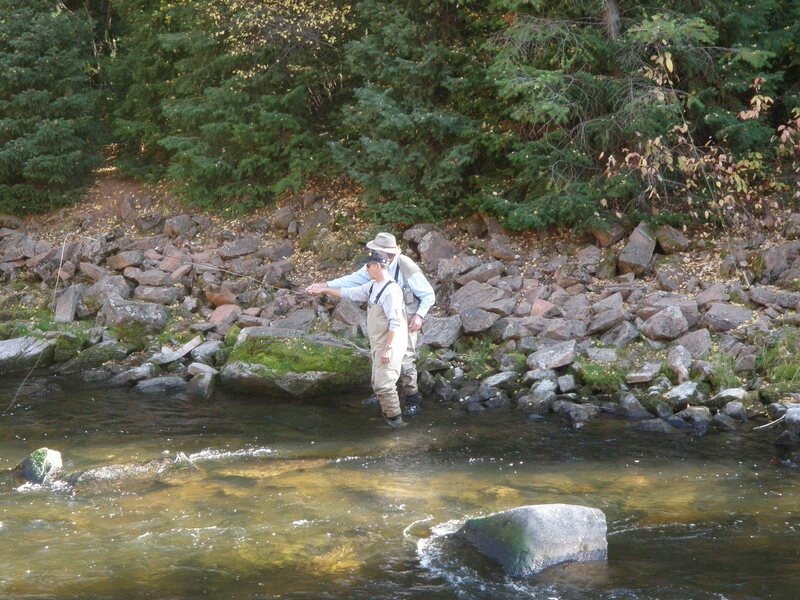 When I was directly in front of Judy, I spotted three trout stacked up in a nice slot behind a boulder. I clipped off the three fly set up and tied on a light gray comparadun as I spotted a few light colored mayflies in the air and on the water. This got inspected but refused. I also observed some caddis dapping on the surface, so next I tried a light yellow size 16 deer hair caddis. On the fifth cast directly behind the rock, the lead trout rose and sipped in my fly. I set the hook and landed a fine brown trout in front of the fans. 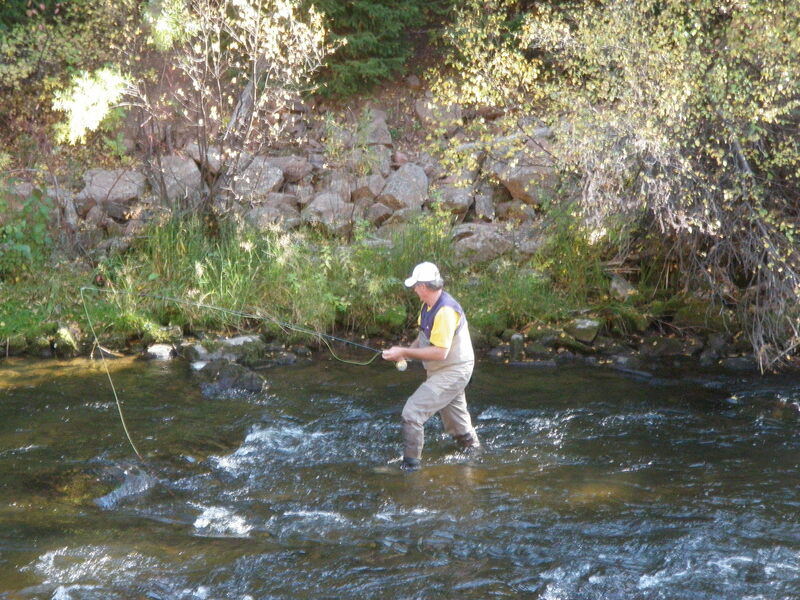 On that note I called it quits and drove the guys back to the fly shop in Basalt. After they’d returned their equipment, we all met at the Riverside Café next door to the fly shop for appetizers and drinks, and then we strolled to the main street of Basalt and ate dinner at Barnard’s. 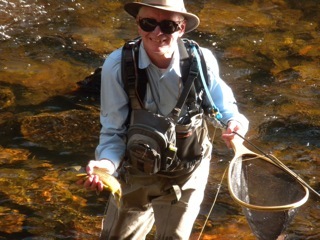 This entry was posted in Fishing Reports, Frying Pan River by wellerfish. Bookmark the permalink.